My tools are very important for me and I always appreciate if they are helping me enjoy my work. Here is the latest addition to my arsenal. I received a wonderful collection of supplies from Knitter’s Pride that I would like to share with you. 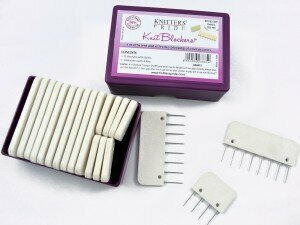 The Knitter’s Pride Interchangeable Needle Holder will keep your needles organized. This is brilliant! 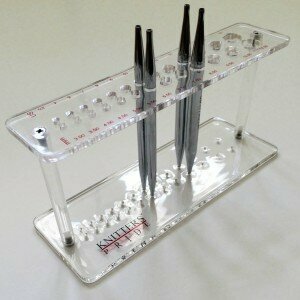 The top of the needle stand has the sizes printed in both US and mm from size US 2 1/2 to 17. Having my needles out and instantly available keeps me motivated to start my next project. The design is sleek and saves space. 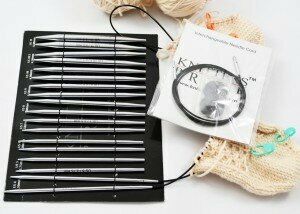 The Knitter’s Pride Nova Platina Interchangeable Needles and Cords are easy to work with. You see that I am already working two socks-at-a-time on these beautiful and very smooth needles. The joins between the needle and the cord are smooth and will not snag your yarn. This set contains US size 4 to 11. 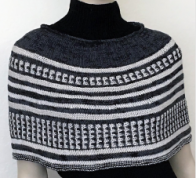 The metal needles make for fast knitting yet feel light in your hands. 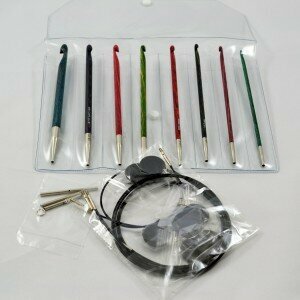 I’ve enjoyed using the dreamz Symfonie Wood Interchangeable Tunisian/Afghan Crochet Hook Set. The set is hand-crafted and each hook is a different color. The sizes range from US E/4 to L/11. The set includes four cords, 24″ up to a 40″ length. These needles are made of wood and are comfortable to work with. The Knitter’s Pride Knit Blockers are wonderful. I wanted to get these for awhile now. 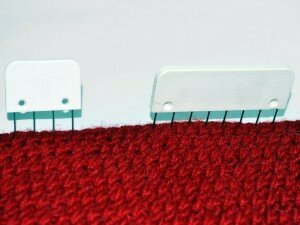 Instead of using many individual blocking pins, these blockers come in sizes of 8 pins or 4 pins. The blockers resemble small combs but the pin points are very sharp! The pins are rust resistant stainless steel. Using the blockers is simple and keeps your work evenly spaced. These blockers will keep your tension even and allow you to block your work more quickly. I just love them! I hope you do too. These tools will definitely make your crafting more enjoyable!